Ever since I moved to LA, my skin has been parched. I guess I just didn't really realize that moving to a dry climate would actually make my skin be, well, dry. I've been slathering on anything I can think of to restore moisture -- and one of the best products I've used is Bliss Blood Orange + White Pepper Body Butter. I received a sample of this body cream when I signed up for the Bliss Spa Membership. (And, yes, I signed up for this within my first week of living out here. Priorities.) I got a whole beauty bag full of goodies, and thankfully this miracle worker was nestled inside. It would be enough that this body cream smells fantastic. It's citrusy without being too sweet, thanks to it being cut with a tinge of white pepper. The scent lingers but doesn't feel cloying or annoying. But what's even better is that my skin just feels SO MUCH BETTER after I use it. A dime-sized amount is enough for both hands to feel baby soft, moisturized and nourished beyond measure. The body cream sinks right in without feeling greasy, so I can immediately go back to my iPhone or laptop and type without leaving residue all over the place. Even my cuticles are in better condition! Thank goodness this body cream showed up when it did. My skin has never looked or felt better! 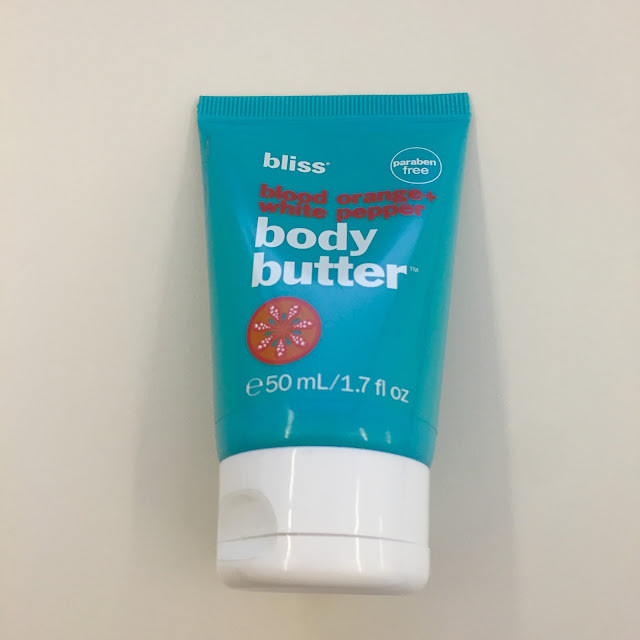 Bliss Blood Orange + White Pepper Body Butter retails for $29 at blissworld.com. I love blood orange and Bliss so this sounds divine! Umm wow this sounds amazing, I love Bliss! Blood Orange is delectable! I have tried this one, and it is fantastic! Yeah, despite the fact that the climate here is far more mild than other parts of the country my skin gets a bit parched this time of the year. I am using lots of bey oils and body butters to get through the colder weather too! I've always been curious about the scent of this, but never tried it. I might have to change that! I had a sample of the lemon body butter and omg it was SO amazing! This is probably the only Bliss product I've bought. I had a sample and liked it enough to buy a big jar which is unusual for me. When I had it I used it mostly on my legs. I love Bliss body butters but haven't tried blood orange - it has mostly been lemon and sage so far. This product sounds TDF your ride or die! I think I have a sample somewhere I need to put it to use!